Excellent, exactly what we need. Before delving into code, you might want to take a look at the Gson User Guide and bookmark the Gson API Javadocs. Let’s get started by downloading Gson, with the current version being 1.6. We need the gson-1.6.jar from the distribution. Add the Gson JAR to your project’s classpath. 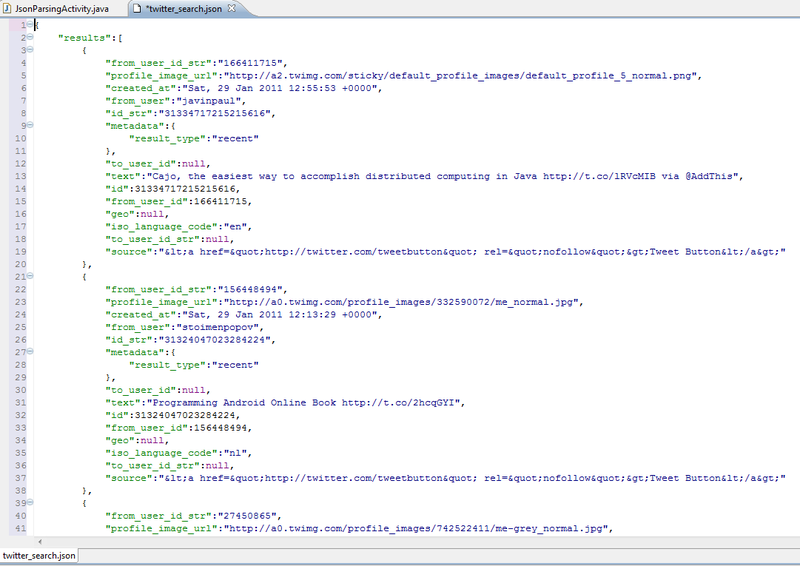 To illustrate how to use Gson for JSON parsing we are going to parse a JSON response from the Twitter API. 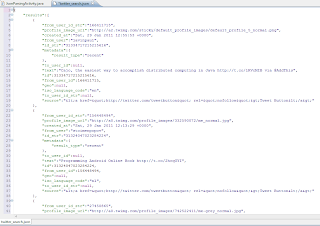 Check the Twitter API Documentation for more info. We are going to use the Search API method for performing ad-hoc searches. As you can see, we have a number of results and after that we have some other fields, such as “max_id”, “since_id”, “query” etc. We provide the various public fields (getter/setters with private fields can also be used) and in those case that the field name does not match the JSON response, we annotate with the SerializedName annotation. First, we perform an HTTP GET request and retrieve the resource as a stream (if you need more details on this, check my previous tutorial Android Full App, Part 2: Using the HTTP API). We create a Gson instance and use it to perform the JSON parsing and retrieve our model object with all its fields populated. 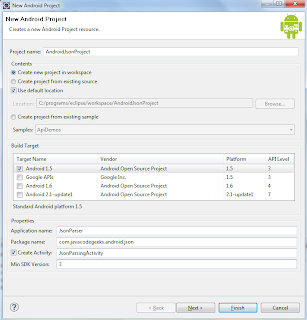 Edit your Android manifest XML file and grant permissions for Internet access and then launch the Eclipse configuration. You shall see notifications of the latest Twitter users that have tweeted about JavaCodeGeeks. That’s all guys, quick JSON parsing in Android with Gson. As always, you can download the Eclipse project created for this tutorial. Happy mobile coding! Don’t forget to share! 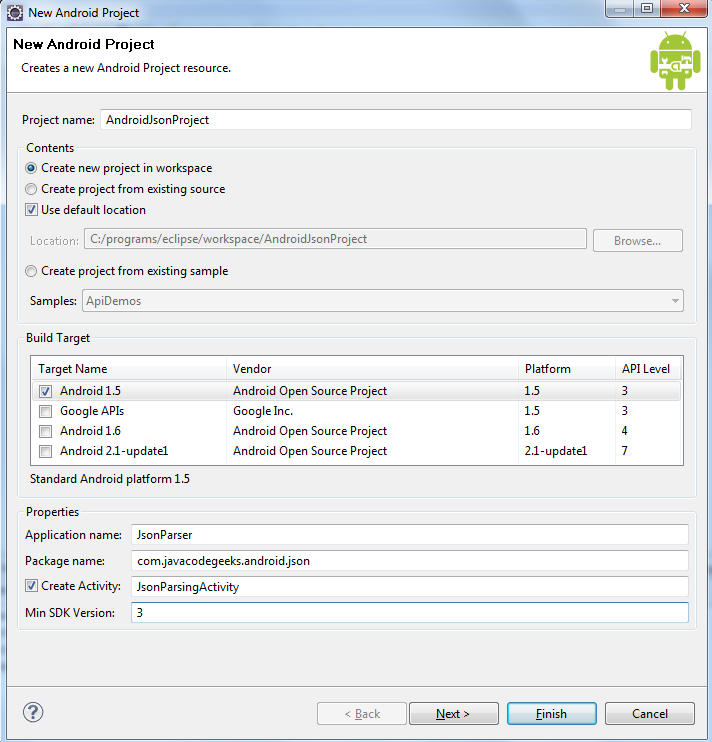 can u tell me output of this example.or show output of screen shot of android emulator.and one more question. i m confuse about which parsing is use json class provided by android or gson API.which one is good? can anybody tell me answer of the following problem? suppose on the client i want to access web service and consider that web service return java object instead of json string then is it possible to parse that java object into json object and shows the result in android listview????????. if no then tell me the solution of this problem.Thanks in advanced…. I am beginner in Android, and I was able to run your sample. Thank you. But, In the following line of code, I was unable to understand as to how “fromJson” function is also automatically populating the public List list, member of SearchResponse class? You know what, thank you very much from the bottom of my heart. What if I want to send a parameters to my webservice? Dude you are a hero, this code really helped me. Can i retrieve data from an executed php file on a database? Thanks my friend helped me a lot. Is it possible to make JSON Parser more generic ? Without mentioning any parent or child node tag in the code i need to parse the JSON file and display it in a Android Activity. That was a great little bit of code.. So clean I could eat off it. Respect! Hey, nice tutorial. The link in your tutorial http://search.twitter.com/search.json?q=javacodegeeks appears broken. Could you fix it? As one cat above already said, the URL to target no longer works. I tried this, but unfortunately the sample URL given (“http://search.twitter.com/search.json?q=javacodegeeks”) no longer works, as the Big Tweeter has pulled the rug out from under our feet and made it obsolete/deprecated it. Running the app simply resulted in the “The response was empty.” toast.